On a break from boarding school as a teen in Saint Lucia, Nina Compton whipped up some canapés and punch and delivered them to her eager family outside on the veranda. She doesn’t really remember what she made, just how her family reacted. “Just to be there cooking and entertaining and spending time with my family … seeing how happy they were made me so happy,” she says. It was an early, emotional moment along a rapid-fire road to her highly heralded culinary success. Now, Compère Lapin, the restaurant on Tchoupitoulas Street that Compton runs (along with her husband, Larry Miller), is turning two years old, and to say it’s been a whirlwind is a bit like saying Hurricane Katrina was, well, just a whirlwind. From Miami’s rising star and fan-favorite runner-up on Top Chef in 2014, to inspiring the first-ever Restaurant of the Year designation from The Times Picayune, Compton most recently made the shortlist for the 2017 James Beard Foundation award in the Best Chef: South division. She was in good company with fellow locals Slade Rushing from Brennan’s and the winner, Rebecca Wilcomb from Herbsaint. 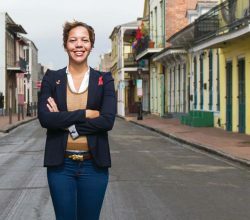 For Compton, transplanting to New Orleans was two parts desire and one part fate. After Top Chef ended, she was bombarded with restaurant offers all over the country. But she didn’t jump until she got a phone call offering her the new restaurant space at the Old No. 77 Hotel & Chandlery in New Orleans. She had long relished the energy of the city and says the culture here is like nothing else. “When I first saw the space, it was just an empty shell, but I walked in, and felt it right away,” she says. Compton named Compère Lapin for a mischievous rabbit in a Caribbean folktale but designed the menu with locals in mind — local flavor, local produce and enough variety that locals can pop in several nights per week and pick something different according to their mood. That’s how she prefers to eat as well. “If I’m looking for something comforting that really speaks to me and going back home, I love the curried goat and gnocchi,” she says. “But if I want to go nice and light, I love the marinated shrimp and roasted jalapeños … it’s cool, refreshing and spicy with lots of flavor.” For dessert, she says you can’t go wrong with the roasted banana zeppole with rum caramel sauce — the almost-beignet meets almost-bananas-foster. But who’s counting? Beyond the James Beard Foundation recognition, Compton’s chef skills have propelled the restaurant to notable lists like the Zagat’s 10 Hottest Restaurants; Huffington Post’s Best Restaurants in the World; and 10 Best from U.S. Today, among others. You should know: “When you have your own restaurant, it’s something very personal to you,” Compton says. “That’s you; it’s you on the plate. You’re putting in 15 hours every single day making sure everything is perfect. Sometimes you doubt yourself. But in the oh-so occasional spare time: Compton plays tennis, goes horseback riding, relaxes with her husband, plays with her two dogs and — you guessed it — goes out to eat.